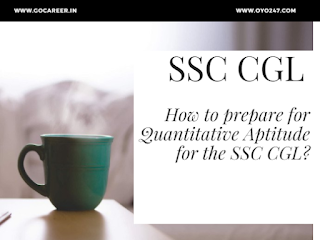 How to prepare for Quantitative Aptitude for the SSC CGL/CPO? Hello Friends, As we know SSC has declared notification for CPO 2018 and invited interested and eligible candidates to apply online until 02 April 2018. So if you have not filled your form still now then we recommend you to apply ASAP without looking for the last date. In Arithmetic part, we include some basic chapters like Profit-loss, Average, Percentage, CI and SI, Speed etc. And Advance Math we include some chapters like Algebra, Geometry, Mensuration, Trigno etc. You can start with Arithmetic and then go for Advance Math. Try to complete all concepts within 1.5 - 2 months. While learning concepts also learn short tricks this will help you in solving questions in less time. You can download Class Notes by Rakesh Yadav or SSC Hacks for Math, These books are worth to read as in these books you get all short tricks for Math (Arithmetic + Advance). If your basic is very week in Math then You start with another book like Quicker Math which will help you in understanding concepts in details. Never waste time on a single question, if you are unable to solve a question never stick to that and note that question in a notebook. While you are learning concepts you can try to solve last year questions which were asked in CGL exams. This will give you a full idea of the level as well as the pattern of exam. If you want to know the full list of best books for SSC CGL/ CPO then check here.